What Is The Best Workout For Increased Toughness? What is the best workout for increased toughness? Improve your performance and success in the ring or on the field with these training tips, ideas to increase aggression, a sample workout, and mind techniques to make you tougher! TOPIC: What Is The Best Workout For Increased Toughness? Increased aggression/toughness can play an important role in pushing the limits during training or push you harder when in the ring or on the field. What is the best workout for increased toughness? Be specific. What other things can one do to increase toughness/aggression? Is toughness/aggression all a mind game? If so, is it possible to alter one's mind to becoming tough? Increased aggression/toughness can play an important role in pushing the limits during training or push you harder when in the ring or on the field. Having that extra edge over the competition is crucial for success. Ori Hofmekler once wrote a book entitled The Warrior Diet which had cited a revolutionary form of training referred to as "Controlled Fatigue." What does this have to do with becoming tougher? "Controlled Fatigue" is a technique which allows one to increase/achieve a state of mental toughness through high volume ballistic exercise execution followed by a strength training workout. This grueling form of training requires extreme mental determination to finish this intense muscular endurance type of workout. The results are worth every effort not only for the additional size and strength but the ability to outlast and out-perform the competition. To become tough; train hard. Click Here For A Printable Log Of EAGLES56's Workout. *Can be substituted with another ballistic movement such as sprinting, jump squats or full body plyometric exercises. Tremendous tenacity is a must in order to complete the above. Start off with light weights since the volume will induce fatigue early and add weight with time and progression. How Does This Workout Increase Toughness/Aggression? To push past muscular fatigue requires a great amount of commitment. While in this state, one becomes a primal animal, with aggression fueling oneself to reach the end, pushing past the standard threshold to achieve victory. Be resilient and tenacious as this will generate toughness. Other ways to increase toughness/aggression include competition, visualization, violent media or external conditions/circumstances, and supplementation. Certain music may psych one up while being infuriated may also induce beastly ferocity which installs toughness. Cranking up the bass and envisioning smashing weights and busting through plateaus always provides an edge. Another way of increasing the alpha-male feeling of dominance and power is supplementation. There are products on the market which allow for increased aggression. I personally have no hands-on experience with these products (however I have heard great things about Applied Nutriceuticals RPM). My advice; Don't be afraid to get angry and attack the weights, just keep things under control to maintain a gym membership. Toughness/aggression is a mind game. Is it all a mind game? No. The amount that mental conditioning influences toughness/aggression depends on the person. With that said, it is always possible to alter the mind to becoming tough. Confidence and self-opinion are vital in the quest for a tough expression. Both come alongside improved appearance, increased performance, and achievement which can all be accomplished through training. **Additional workouts and further information on increasing toughness/aggression can be found at www.dragondoor.com. In my opinion, the best workout for increased toughness is a workout with little to no rest between sets. I have noticed that of all the athletes, wrestlers are generally the most athletic. When they train they do workouts with little to no rest so that they are weak and vulnerable by the end of their workout. They push themselves to the absolute max. A good workout would be a combination of any compound exercise such as squats at high reps until failure and then follow it up with another intense exercise. When you are done with the squats you should be drained of energy and wanting to throw the towel in, but at that moment when you are weak, you do your next exercise to push yourself mentally and physically. There are many things one can do to increase their aggression. Some supplements such as NO products will give you a little pump and possibly help motivate you, but I personally like to rely on my workout partner to piss me off and make me lift hard. 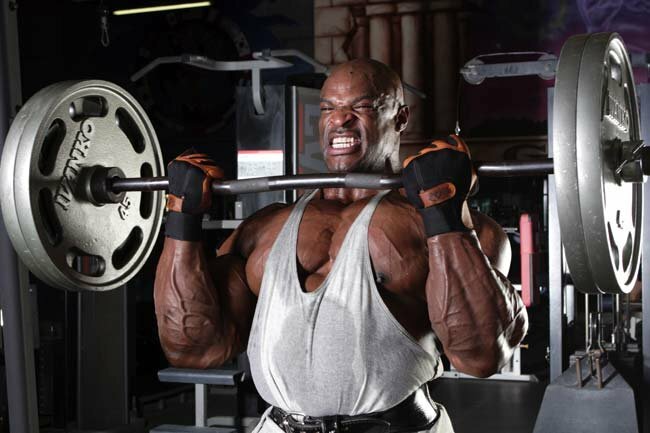 If you have ever heard of Ronnie Coleman, chances are you've seen him train. While he may look silly yelling "LIGHT WEIGHT," it helps him put up those heavy weights. Working out by yourself can sometimes be a bit boring and you might forget why you are even training. If you have a workout partner you can set goals and challenge each other to see who can lift more weight/higher reps etc. Competition promotes aggressive behavior and there's nothing like a bench press contest or pull-up contest to feed that aggression. I firmly believe aggression is a mind game. Some people can't take a challenge and get scared, while others can take that challenge and excel against all expectations. In order to alter yourself into becoming an aggressive alpha-male you need to be confident. In order to be confident you need to psych yourself up before the big lift, or before the big game as athletes do. I used to be a swimmer back in my high school years. We had this meditation coach who we all thought was a big joke and the laughingstock of the swim team when we first heard about him. However, after our first meeting with him, our thoughts quickly changed. Our first meeting was held two hours before the big swim meet. We laid down on the floor and relaxed our muscles. He then told us to visualize ourselves in the water, feeling confident, relaxed, really fast and beating our old swim times and setting new records. Right after we did that we went out and did a motivational chant and some cheers to get us pumped up. Our coach taught us how to be confident first, and then helped us spike our aggression right before the meet and swim some of our best times ever. We won the state title that year, I firmly believe that it was all thanks to the help of our meditation coach. My advice to you is to meditate, see yourself doing your workout, and lifting some heavy weight. Then get yourself pumped up with some music or a workout partner. Aggression is completely mental, but it's amazing how your mind power can control your body. Toughness is not something that can be achieved through a workout. Certain workouts can give the appearance that you are tough. Almost any workout program can make you look tough. Basically you are going to be big and solid, relying on an intimidating look for toughness or a cut figure with solid mass that just shows you take what you do seriously. Again there is no specific workout, but here are some links to popular programs. I personally believe that toughness and aggressions are one of those things you are born with. If you are not born aggressive, you can become aggressive, just not as much as the guy next to you may be. To actually increase one's toughness is not easily accomplished. One thing that supposedly works are supplements like testosterone boosters. In all honesty, I cannot comment on these products because I never have used them, and have no intention to. In addition I aim much of my advice to teenagers, and those are just unnecessary. One substance I have found to help is caffeine. For my body when I get all the energy from a caffeine rush I start getting jumpy, throw in some hard rock to get my mind set and I can become a scary guy. You often notice the quiet guys are not the ones to be really aggressive, it does happen sometimes, but it's usually the guy getting all riled up and loud before a game that makes the most impact as being a threat. Being tough is all in the mind, although you can make yourself believe you are tough, just hope you can back it up. Weightlifting can give a boost in confidence, which can be the fuel to aggression. I find that whenever I push my limits and max out on a lift higher than the last time, that gets me pumped up, when I look in the mirror and see how deadly my body looks I get aggressive. A big thing is just getting your mind set; focus to what you want, find something that angers you and use it to fuel yourself. The best example of this I have from my own experience is when I think about the last 3 years of rugby and football. I just think about how one team has managed to beat us for two championships, and how much I want to be the one to hold the cup next time around. One thing I find that always manages to get me ready to go when I'm not feeling aggressive is music. Music drives me on many occasions. Anything like some hard rock or rap with a purpose can get me in the mood to hit something. My personal favorites are anything by Eminem, Bionic Jive and some of the older Papa Roach songs.